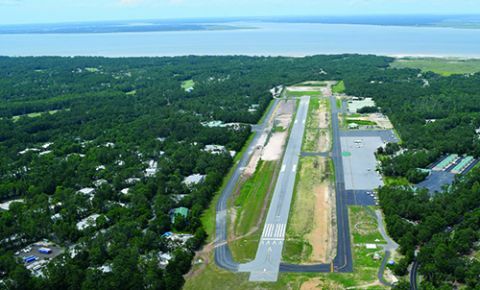 A $14.1 million runway extension project at Hilton Head Island Airport (HHH) will enhance safety and allow the South Carolina airfield to accommodate larger aircraft. At the same time, the project also offers a practical blueprint for how to address local sentiment that runs counter to FAA recommendations. The project, expected to end in late June, adds 700 feet to HHH’s only runway (403 feet on one end and 297 on the other end), extending it to 5,000 feet. The additional length enabled American Airlines—the airport’s only commercial carrier—to replace its Dash 8 turboprop service with regional jet service via 76-passenger Embraer 175s. That provides residents and tourists with more travel options, says Jon Rembold, airport director for HHH and nearby Beaufort County Airport. “In addition, we now can receive private aircraft from airports that are farther away than before, because the longer runway allows them to carry more fuel and people on board. It opens up their range,” Rembold points out. The new length also makes HHH more competitive with Savannah/Hilton Head International Airport, located about 45 miles southwest, and Charleston International Airport, located about 100 miles northeast, both which have runways more than 9,000 feet long, he adds. Along with the runway extension, the airport installed a new $5.4 million stormwater management system that stores, treats and transports rainwater downstream via a system of large underground plastic chambers. Stormwater management is critical because HHH sits amid an 81,000-acre environmentally sensitive watershed that includes the Calibogue Sound, three rivers and their tributaries, creeks, lakes and tidal flats. As such, the area is home to wildlife such as ospreys, bald eagles and dolphins. The new system, which replaced a drainage canal adjacent to the airport’s runway, also serves as a wildlife mitigation tool, because there is no longer standing water to attract animals such as foxes, coyotes, deer, alligators and birds, Rembold explains. The airport further enhanced airfield safety by installing 200-foot-long engineered material arresting systems (EMAS) at each end of the runway. The FAA paid for 90% of the $8 million safety project, the South Carolina Aeronautics Commission paid another 5% and the rest was funded with airport revenue. The entire project took about 18 months to complete. In general, real estate development and airport expansion are sensitive issues for many Hilton Head residents and government officials; and their cautious approach is reflected in the stringent master development plans of local agencies. As such, some residents strongly opposed the runway extension, even though the FAA recommended a longer runway to help the space-constrained island airport operate more efficiently. The FAA also recommended removing the drainage ditch, which posed a safety issue, due to a steep slope between it and the runway, Rembold notes. “The FAA said we needed a 5,400-foot-long runway, based on our fleet mix,” he explains. “But a vocal minority of residents opposed that…They weren’t interested in taking that big of a bite. After a lot of discussion and public hearings, everyone got together and examined the options, and determined that 5,000 feet was more palatable politically. Rembold considers the new arresting beds a great solution, because they enable larger planes to land safely on a shorter-than-desired runway and allowed the upgraded runway to remain inside the airport’s existing footprint. crews primarily worked around American Airlines’ flight schedule, Rembold says. Construction and installation activity typically began after the carrier’s last flight of the day, usually around 10:00 p.m., and continued until about 6:00 the following morning, when American flights resumed. Per FAA regulations, the landscape had to be restored to its original condition each night. For example, no open excavations were allowed, and all slopes had to conform to their normal conditions before air traffic resumed. The upgraded stormwater detention system addressed concerns about protecting the area’s fragile marine ecosystem from runoff and pollutants. That’s a major issue because heavy rainfalls are common and the airport stands only 19 feet above sea level, Rembold explains. Moreover, much of the runoff from the airport originates from a light-industrial/commercial development near the south end of the runway. As such, large influxes of rain can carry pollutants such as volatile suspended solids, oil and grease, heavy metals and salts. Previously, stormwater runoff travelled through the drainage ditch that paralleled the runway. “It ran about 4,500 feet through the airport and exited at the north end of the runway, where it emptied into an off-site stormwater detention area,” Rembold relates. 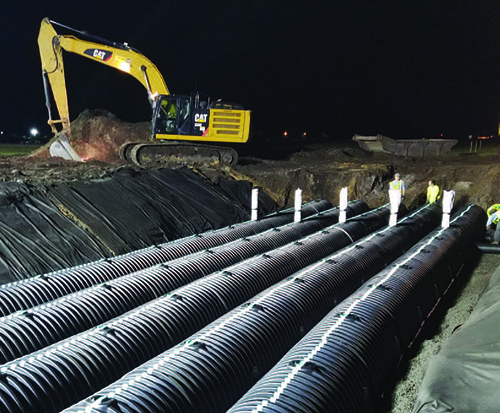 To eliminate the drainage ditch and its standing water, officials opted for large underground plastic chambers that store and convey stormwater runoff. The system holds stormwater long enough for it to slowly seep into the ground. Installing the underground detention system also allowed HHH to eliminate the steep slope near its runway. “It’s just a gentle swale now, so it’s no longer a safety hazard,” he reports. Overall, the airport’s two-section detention system includes 1,646 chambers that span 54,681 square feet and can store up to 152,420 gallons of stormwater runoff. The northern section includes 1,000 chambers (each 4 feet long and 30½ inches high), configured into a five-row system that stretches 1,403 feet. The chambers lie atop a 6-inch-deep layer of stone and are covered by another 6 inches of stone. The northern section alone can store up to 84,420 cubic feet of water in the chambers and between the voids around the stones. The southern part of the system includes 646 chambers, each 48 inches tall and 8½ feet long. They stand atop a 9-inch base of stone and are covered by an additional 12 inches of stone. Total storage capacity exceeds 68,000 cubic feet of water. Shell notes that installing chambers with two different heights is unusual. Engineers typically prefer to use relatively tall chambers to provide more storage capacity in a smaller area, he explains. That, in turn, also decreases project cost because less stone and labor are required. At HHH, however, the elevation on the northern end of the runway is lower than the southern end, so engineers specified shorter chambers on the northern end to allow enough room for sufficient ground cover and to avoid penetrating the water table, which is very high in the area. The airport is a key gateway to the island’s 2.7 million annual visitors. It’s also critical to the regional economy, with an economic impact of $166 million. So when Rembold encountered opposition to the runway project, he embarked on a three-year, one-man public relations campaign. How he went about it underscores the importance—and effectiveness—of establishing good community relations. “Public opinion was our toughest challenge,” he reflects. Because there had been no major improvements at HHH for decades, residents were lulled into assuming that the airport would always remain a small, quiet facility, he explains. Moreover, some residents were opposed to the idea of increased tourism. To help sway the naysayers, Rembold spoke to anyone or any group that was interested. About once a month, for three full years, he gave presentations that detailed how the airfield project would provide more travel options and improve convenience for residents. He also emphasized the economic-impact benefits. In retrospect, Rembold says that residents appreciated having an “airport person” to talk to. He felt it was important to get out into the community and provide an open forum for questions, because people often feel that airports operate secretively from behind a fence. In the end, collaboration and cooperation among many agencies, including the town of Hilton Head, Beaufort County and the FAA, were critical to the project’s success. “They were phenomenal to work with,” says Rembold. “So were our state partners and our consultant, Talbert, Bright & Ellington, and our prime contractor, Quality Enterprises.